It is not long since rover Curiosity reached Mars, and NASA announced that it will be another mission in September 2016 on the same planet: InSight. While Curiosity, with the size of a car, is looking for habitats where microbial life could develop, the new smaller probe, will focus on what is happening inside the planet. With this mission involving equipment, scientists hope to understand how terrestrial planets forms, as ours. The device will penetrate a few meters into the Martian soil to measure soil thermophysical and electrical properties. In this mission some countries will help with test equipment, such as USA, Germany and France. German Aerospace Center, will participate with the HP3 experiment, by which we will understand the structure, core condition, crust and thermal evolution of Mars. Sensors on HP3 were manufactured in collaboration with Austria (Space Research Institute of the Austrian Academy of Science). The French Space Agency (Centre National d'Etudes Spatiales CNES), it is also involved. This country will provide InSight mission with instruments called "Seismic Experiment for the Interior Structure" (SEIS). 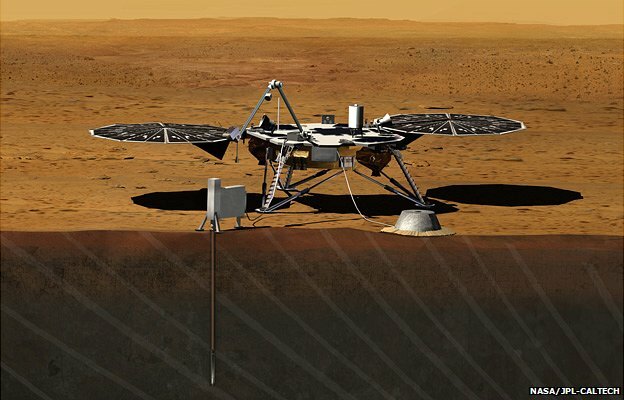 The mission will be led by W. Bruce Banerdt of NASA's Jet Propulsion Laboratory (JPL), which will provide geodesic instruments, to determine the rotation axis of the planet, a robotic arm, and two cameras used to implement and monitor instruments on Mars. In the video below, mission team members for InSight, the new Mars lander mission selected by NASA to launch in 2016, explain how the spacecraft will advance our knowledge of Mars' history and rocky planet evolution.